Allergy Advice: Contains Wheat, Sesame, Soybean, Liquorice. 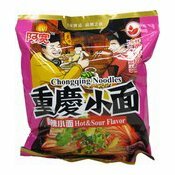 Ingredients: Noodles: Wheat Flour (Gluten) (62.4%), Water, Potato Starch, Stabiliser (E1442), Palm Oil. Oil Pack: Low Erucic Acid, Rapeseed Oil, Palm Oil, Chilli (3%), Sesame, Ginger, Shallot, Fermented Soybean, Garlic, Spices (Cinnamon, Liquorice, Laurus Nobilis, Anise, Lemongrass, Cumin), Flavouring, Preservative (E262(i)), Water. Flavour Pack: Flavour Enhancer (E621), Flavouring, Flavour Enhancer (E635), Salt, Sugar. 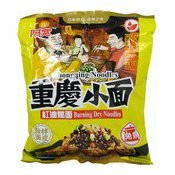 Bean Sprout Pack: Bean Sprout, Low Erucic Acid, Flavour Enhancers (E621, E635), Garlic, Sugar. 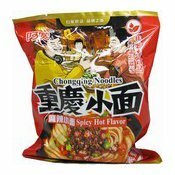 Simply enter your details below and we will send you an e-mail when “Chongqing Instant Noodles (Chilli Oil) (白家重慶紅油燃麵)” is back in stock!